Nearly twenty volunteers came out on Wednesday night to help paint Recovery Aroostook’s recovery center, a space dedicated to helping anyone struggling with addiction. CARIBOU, Maine — Nearly twenty volunteers came out on Wednesday night to help paint Recovery Aroostook’s recovery center, a space dedicated to helping anyone struggling with addiction. Erik Lamoreau, the public relations chair of the newly formed non-profit, said they hope to have the building open by Valentine’s Day, Feb. 14. The recovery center is located at 14 Old Van Buren Rd. in the former Catholic Charities thrift store. 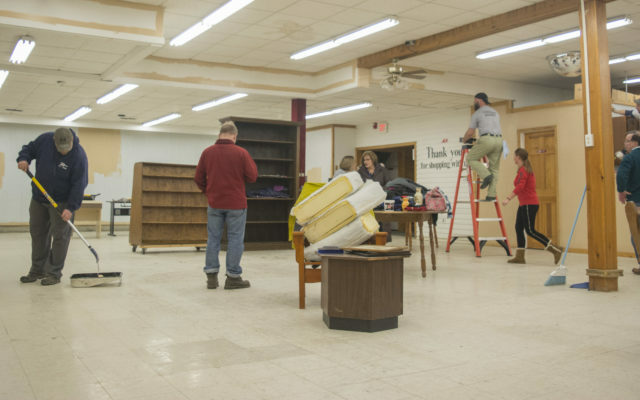 Recovery Aroostook is leasing half of the building from Catholic Charities, who plan on reopening the other half as a thrift store in the future. Lamoreau says the recovery center will offer peer-to-peer services, consulting, and access to additional resources. At first, volunteers hope to open the center two days a week, eventually expanding to five days a week. Center workers will be CCAR (Connecticut Community for Addiction Recovery) trained, and will help people seeking assistance in any way they can. Lamoreau emphasized that the facility will help people at any stage of addiction, whether they’re still addicted, going through detox, or have been clean for months and are seeking additional support. The work on Jan. 31 consisted of painting. Moving forward, however, volunteers will start putting up walls and creating separate rooms inside the recovery center. Between his involvement with Recovery Aroostook, owning Allen’s Way, a sober house on Bennett Drive, taking classes at UMPI and NMCC, and working at the Aroostook Mental Health Center, Lamoreau has been tremendously busy. As far as the large turnout of volunteers is concerned, Lamoreau said he isn’t at all surprised by how many people showed up to paint the building’s interior.